ITALIAN cuisine is very much like the country  different and full of flavour and zest. Pizza is perhaps the most popular Italian dish found in many different countries today. These are also very unique and their taste and ingredients vary from place to place. People tend to pick up the culinary habits of the country they are in, thereby lending the food a different taste. Another reason is that there are many ways to make a pizza and top it as well just as there are many different flavours in a biryani. Apart from pizzas, Italian cuisine has many different and equally delicious dishes. Minestrone soup, lasagne, spaghetti bolognaise, antipasto, to name a few. Italy has a variety of fresh fish and this shows in the numerous recipes for fish that you can find in Italian cookbooks. Apart from this olive oil, Parmesan cheese and garlic would perhaps be two very distinctly Italian ingredients that set Italian cuisine apart from most other cuisines. 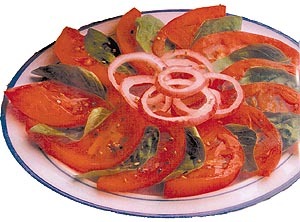 To make antipasto you need to make two salads one of tomato and the other of potato and then combine them together. First, the recipe for tomato salad, then the potato salad and finally the antipasto. Slice the tomatoes into wedges and put them in a bowl. Pour the olive oil over them and season with salt and freshly ground black pepper to taste. Add a dash of sugar and onion and mix well. Boil the potatoes till they are cooked but not overdone. Peel and slice the potatoes and put them in a bowl. Pour the oil, vinegar, crushed garlic, chopped parsley on to the potatoes while they are still warm. Season with salt and freshly ground black pepper. Slice the pepper into thin circular pieces and arrange them in a big salad platter. Put the tomato and potato salads on top of this. Cover the top with the hard-boiled eggs, cutting them either into circles or into wedges.